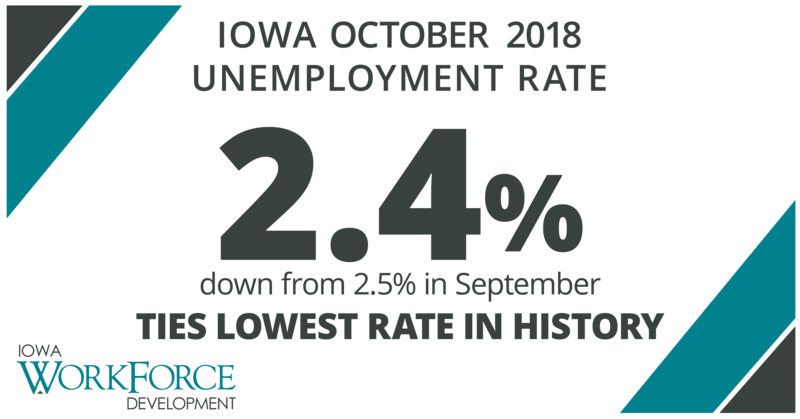 Iowa’s seasonally adjusted unemployment rate dropped to 2.4 percent in October. The state’s jobless rate was 2.9 percent one year ago. The U.S. unemployment rate remained at 3.7 percent in October. 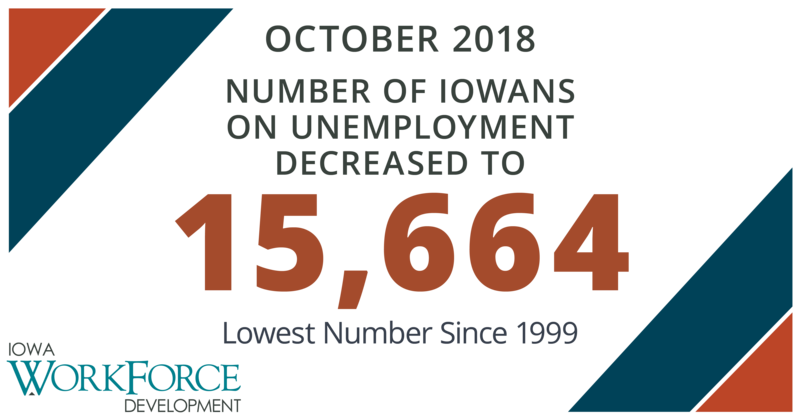 A 2.4 percent unemployment rate in Iowa was first recorded nearly 19 years ago in December of 1999. The rate held there until March of 2000, making this October the fifth month since the Local Area Unemployment Statistics program began in 1976 that the rate recorded was this low. The number of unemployed Iowans decreased to 41,200 in October from 41,800 in September. The current estimate is 8,000 lower than the year ago level of 49,200. Following a job loss in September, businesses in Iowa returned to hiring in October and added 3,900 jobs. This monthly gain more than offset a loss of 2,100 jobs last month and leaves the state up 21,800 jobs compared to one year ago. Private sectors again were responsible for all of the gain this month. Government shed 1,000 jobs following another loss of 3,600 last month and now trails last year’s mark by 1,800 jobs. Much of this loss stems from the state government level (-1,300 jobs). Overall, seven of the ten private super sectors added jobs and only three lost jobs. Leisure and hospitality added the most jobs in October in Iowa (+2,100). Arts, entertainment, and recreational industries provided most of the added employment (+1,300). Many of these gains were due to special events bolstering staff levels in amusement and recreational industries. Construction also continued expanding this month, adding 1,600 jobs. This is now the ninth-consecutive month of job growth for the construction sector. 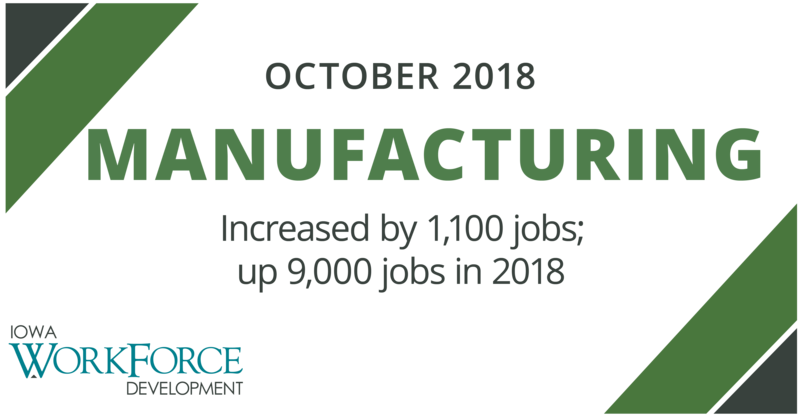 Manufacturing grew in October in both durable and nondurable goods factories and gained 1,100 jobs. The only losses for this super sector occurred in April and May when a combined 200 jobs were pared. On the other hand, retail trade continued its struggles this month, paring 500 jobs. The super sector was lifted by usual hiring in transportation, warehousing, and utilities. This has been true throughout 2018 with transportation, warehousing, and utilities gaining 4,500 jobs annually. All other super sector losses this month were small and limited to education and health services (-300), professional and business services (-200), and other services (-100). Annually, Iowa remains up 21,800 jobs following the October hiring. Manufacturing is now up 9,000 jobs to lead all sectors. Durable goods factories have been responsible for a majority of that growth (+6,100). 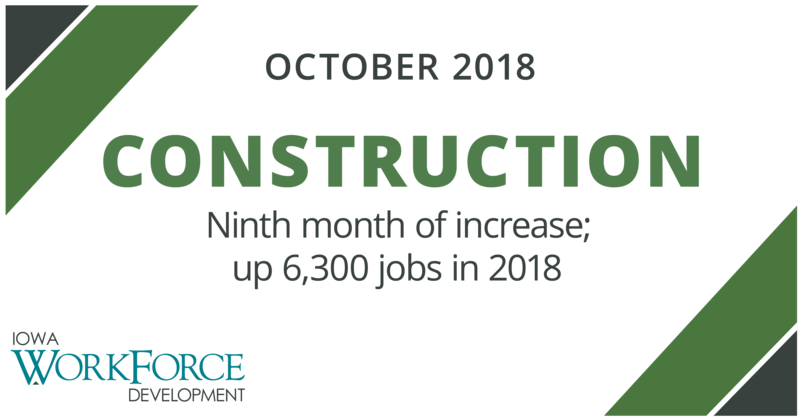 Construction projects have been strong in 2018 and continued well into the fall this year, leading to a gain of 6,300 jobs over last October. Losses are light annually and limited to other services (-1,800). MEDIA ALERT: Click here to access an audio cut of comments about Iowa's labor market situation. Local data for October will be posted to the IWD website on Tuesday, November 20, 2018. Statewide data for November 2018 will be released on Friday, December 21, 2018.